From buying art to shaping it, Asia’s artistic footprint is growing. Along with splashy weddings and the world’s largest luxury craze, a growing number of Asia’s rich are apparently pouring their money into amassing large collections of art now too. Yesterday London-based Christie’s auction house revealed its first-half earnings for 2013 of 2.4 billion pounds, up 9 percent from last year. One noteworthy trend was present in these figures: bids from Asian collectors spiked a whopping 15 percent on year. Christie’s wasn’t alone in this Asian surge. Sotheby’s saw bids coming from Asia jump 13 percent over the same period, driving the auctioneer’s sales up 6.5 percent on year to $2.55 billion. And the auctioneer’s major shows in Shanghai and India are set to take place in September and December, respectively. Once these lucrative auctions kick off, it’s hard to say how high annual sales will reach – let alone how much of the purchases will come from Asia. And with Asians predicted to account for the largest proportion of the world’s wealthy by 2017, this trend is unlikely to be derailed. Of particular note, sales to Chinese buyers are returning to the levels they reached in 2011, at which point China became the world’s largest art market. From 2009-2011 alone, art sales in China skyrocketed 350 percent. While art sales in China may have dropped to second place last year, falling behind the U.S., the Middle Kingdom’s collectors came back with a vengeance in the first half of this year. Now they are showing little sign of fatigue in their quest to amass art collections, even amid the global economic slowdown. “China had a slight pause last year with economic slowdown and a government in transition, but now we are seeing levels back to where they were in 2011,” said Christie’s Chief Executive Steven Murphy. Among Christie’s marquee sales were Jackson Pollock’s $58 million “Number 19”, a $56 million Roy Lichtenstein piece, and a $27 million Mark Rothko canvas; while Sotheby’s struck gold with a painting by Gerhard Richter that sold for $37 million and Barnett Newman’s “Onement VI”, which went for $44 million. These major sales are all works by Westerners, but this too is starting to change – again with a strong push from the East. Perhaps the clearest evidence of this shift was the first Art Basel event in Hong Kong this May. It was the first time the world’s leading art fair waved its banner in Asia. Hong Kong may be the third largest art market in terms of sales, but other centers are taking shape. New Delhi and Singapore are also being touted as emerging power centers in the art world. 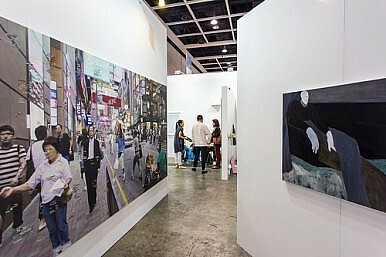 As seen at Hong Kong’s first Art Basel event, a large number of Western works were on display. But their presence was balanced by a likewise impressive showing by regional artists who are shaping global artistic dialogue and proving that inspiration flows both ways. Moreover, and just as significantly, Asians are becoming interested in art from other parts of Asia. “Today if you don’t know what’s happening in Indonesia or South Korea, then you’re not going to understand what’s happening in Belgium,” said Hallam Chow, a Hong Kong-based art collector who specializes in Indonesian and Chinese art. Increased interest in regional artists both by those living within and outside the region, combined with the art industry infrastructure that is forming, will likely precipitate the formation of a much larger and more cohesive regional art scene. The money, the interest and the talent are all in place. As China's auction houses expand abroad, foreign firms are tightly restricted from entering the booming Chinese market.